I hope everyone had a FABULOUS weekend. It was gorgeous here in Colorado. It was sunny and in the 70s. The peaks were covered in snow, and it was one of the best views of the Front Range I’ve seen in quite a while. I pretty much spent my Sunday packing some things up around the house. We are getting closer and closer to the big move! Eek! So exciting! So anyway, let’s talk food, shall we? I know I have talked endlessly of this, but I get so much satisfaction when I can eat something lemony! Unfortunately, I don’t eat it very often because for some reason unbeknownst to me, Zach hates the stuff. I know. I know! I love chicken and lemon orzo soup. It’s by far one of my favorites. It’s so hearty and full of nutrients. It’s also so warming, which is great during the Winter months. I also love it when I’m not feeling so well. It’s an extremely simple recipe and it certainly won’t break the bank in expensive ingredients. It’s the perfect chicken soup so give it a try! Description:The day I found out that Elysian would make Loser Pale Ale available all-year round was a very happy one. It’s one of the best pale ales out there, with the crispness you crave you with a pale ale. It has a wonderful citrus quality and is perfectly light and refreshing. It also has a nice malty finish, which I just love with a good pale ale. I wanted something refreshing, yet robust with flavor for this soup. Anything “crazier” would take away from the flavors in the soup. It’s a great beer and a superb pairing for this chicken and lemon orzo soup! 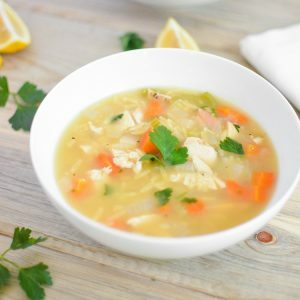 This chicken and lemon orzo soup is hearty, healthy and comforting! In a dutch oven, heat the olive oil over medium heat. Add the onion, carrots and celery to the pot and cook for 6-8 minutes or until tender. Add the garlic and cook for 1 minute more, or until a garlicky aroma fills the air. Season with salt and pepper and sprinkle the mixture with the herbs de provence. Add the white wine to deglaze the pot, and cook until it has reduced by half, about 3-4 minutes. Add the chicken broth, lemon juice and lemon zest. Bring to a boil, then reduce to a simmer. Add the orzo and cook until al dente, about 6-8 minutes. Reduce the heat to low and add the chicken breast and fresh parsley. Cook for 4 minutes more. Serve warm, garnish with parsley. I seriously need a bowl of this soup. It looks fantastic! Thank you Jocelyn! It certainly was just what I needed!